A recent StoryCorps recording featured a conversation with François Clemmons. Clemmons played the role of Officer Clemmons on the program, Mister Rogers’ Neighborhood. Clemmons, an African-American graduate student, met Fred Rogers, a white Presbyterian minister, in 1968. After meeting, Fred Rogers invited Clemmons to participate on his television program which was marketed toward children but which, quite arguably, was a gentle teacher to many adults who sat with their children to watch the show. Policeman [sic] were sicking police dogs and water hoses on people. And I really had a hard time putting myself in that role. So I was not excited about being Officer Clemmons at all. 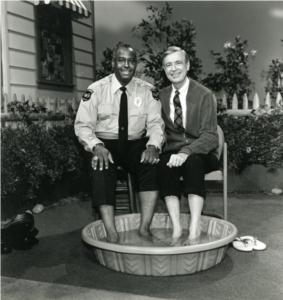 But Clemmons does accept the role of a police officer in Mister Roger’s Neighborhood and, in one scene, Fred Rogers invites Officer Clemmons to sit with him and cool his feet in a wading pool. There they sit, on national television — a white man and a black man, their feet resting beside each other in the very same pool of water — as if it’s the most normal thing in the world. The icon Fred Rogers, not only was showing my brown skin in the tub with his white skin as two friends, but as I was getting out of that tub he was helping me dry my feet… And so that scene touched me in a way that I was not prepared. In Colossians, Paul reminds us of the importance of compassion. Just as we dress ourselves in jeans and a t-shirt, sneakers and socks, Paul tells us compassion is the spiritual equivalent of an outer garment. As people who have received much compassion — people who are holy and dearly loved, compassion, kindness, humility, gentleness and patience should be the way we move through the world. When we take these virtues with us, into every encounter in every day, even small moments make a difference for eternity. When have you experienced the compassion of another person? When have you extended compassion toward another person? How can you remember to clothe yourself with compassion on a daily basis? Dear Lord, you are full of compassion and I have been richly blessed because of it. Thank you for loving me, exactly as I am. Help me to be compassionate toward those I meet today, accepting them exactly as they are. Amen. Image Credit: By Dr. François S. Clemmons – Own work, CC BY-SA 4.0, https://commons.wikimedia.org/w/index.php?curid=41429120. Explore more at the Theology of Work Project online Bible commentary. Just WOW! Thanks for sharing this beautiful picture!! I near cried…the good kind of cry. You really inspired me and contributed to a decision I need to make, Deidra. Thanks. Thank you for sharing this story. Mister Rogers truly shaped my life from as early as I can remember. This is a true example of how not to be a respecter of persons. Thank you again, friend. Beautiful story. Thank you for sharing. We are all God’s children and we need to show His love to each other.